A few years ago, we stumbled upon the idea of using the part of the church calendar called Ordinary Time to bring a new energy to the summer months at Vintage Fellowship. It has become some of the most sacred and amazing time of the year for many of us as it is a time to remove the veil between the Holy Place and the Holy of Holies. We bring ordinary life inside the church space. We sing songs from the radio. We eat bread and wine for communion, but also every other food that is beautiful and delicious. This year we chose to anchor our experience in a word or phrase from this blessing from the Book of Common Prayer, asking different people from the body to share their thoughts each week. This week, we considered "the wonders He has shown you..." and I wrote this to share. When I was a little girl, I remember a morning in summer that called me outside before any other person in the house was awake to interrupt my own little plans. There was probably a box of generic Cheerios propped on the table with the angular plastic bowls that had started life as margarine containers for the taking, but I was after something else. When you grow up in the country in Pennsylvania, inside your house might stay the same year after year with the sun fading an ever-present throw pillow with the shadow of the cross - formed from the window munions, but outside was new every morning and needed daily exploration. For example, You might go to sleep to impossible blackness that settled down after an orange sunset at 4 in the afternoon and wake up to every last branch and blade bent under the weight of snow as thick as butter cream frosting on a wedding cake. I lived every day of my first 18 years on three acres of land facing a wooded hill that wanted to be an Appalachian mountain and couldn’t quite manage it. First a blue and white striped mobile home and then a proud and cozy split level house that smelled like new wood faced that hill like the seats of an amphitheater. Where the stage should be in the theater, instead there was a pond, draped on either side with apple trees that did what proper apple trees should do, blossoming out in the spring and producing green apples in the fall. Every morning, the show would start with a light check, first pale gray, then salmon pink and finally the lemon yellow beams of sunlight. Depending on the time of year, the sun itself might be reflected in the pond, and at night when the all the conditions were right, the moon did the same thing. Most impressive were the Hunters Moons of October that rose eerily orange creating creepy silhouettes of the birch tree branches in the front yard just like a picture in one of my few picture books. This was my whole world. On this morning, I slipped out in my bare feet, padding across the back porch constructed before the days of treated lumber, and therefore painted brick red to contain the slivers. Down the four steps to the wet grass, to the left, a narrow creek cut the back yard in irregular pieces. I avoided the wide, flat footbridge that spanned it, always conscious of how well the garter snakes liked to sun themselves. I was then –and still am- terrified of snakes. Imagining stepping on one in my bare feet kept me awake at nights making my teeth chatter with fear. Instead, I turned to the right, being careful not to slip on the heavy dew down the slight hill that hugged the side of the house. In winter it made the perfect sledding spot. If you plotted it just right, you could make it half way down the driveway from the rise, bread bags in your boots and hands screaming wet and red inside your wet yarny mittens. But it was summer. So it wasn’t snow calling me outside, but instead, the garden at the side of the yard. This was the lower, second garden. A solid acre over the snake footbridge behind me was garden too: First a row a gladiolas, then rows of green, yellow and kidney beans. A half row of Swiss chard met a half row of creepy tumorous brussell sprouts and then a vast array of tomatoes, followed by at least six rows of corn with squash and pumpkins as the headlines. At the top of that garden was our tree house, more accurately -a cabin with built in bunk beds and screens on the windows. My mother sewed curtains for the windows just to make things pretty. On top of the tree house rested a huge wooden beam taken from a torn-down railroad station that held three swings made with good nylon rope from Dad’s farm and garden store and flat wooden seats. I would swing for hours, often alone, but sometimes in contests with my brother and sister to see who could jump the furthest from the highest point in the swing’s arc. The lower garden, though, was for potatoes, zucchini, radishes, peas, lettuces and more tomatoes. It takes a lot of tomatoes to make the 100 quarts of tomato juice that would feed a hungry family of six all winter long. And also…..strawberries. Everything else my parents plopped into the black dirt seemed to grow like a beanstalk, but that patch of strawberries simply could not be relied upon. They might grow or they might not. And never with the abundance required to make enough jam for the thousands of peanut butter and jelly sandwiches we must have consumed. Mom and Dad finally gave up and put in a patch of more predictable red raspberries that yielded more than enough for jam and for garnishing our cereal on a regular basis. On that morning, though, I found the berries I was hoping for. I ate one, and then gathered a handful for a project I had in mind. I hesitated a bit before heading to the garage. I was wondering if I had enough. Perhaps I should check the field? Beyond the side garden, a grassy hay field curved up and around the corner where my aunt and uncle had a low, green shingled ranch house where they raised six cousins, four older than me and two younger. Between us, in that hayfield, growing low to the ground, a patch of wild strawberries flourished. They were tiny and tart and better tasting than any tame strawberry ever could be. To reach the patch, I would have to wade waste deep through goldenrod, Queen Anne’s lace, wild daisies and milkweed. My mother was never in short supply of bouquets because I often picked handfuls to grace her red and white checked table. The risk in running the field either way was one of two things: if you ran from the field toward the house, you had to mind the clothesline, which sagged exactly at the line of my chin, and during a particularly good game of hide and go seek in the dark one night, I had hit that line running full tilt and landed flat on my back, gasping for the breath that had been knocked out of me, a line-shaped bruise forming at my jaw line. The other very real danger in running the field was breaking the ribbon of an orb spider web with your chest and winning the gold medal of a three-inch spider around your neck. My little hands clutched the handful of berries in front of me like an offering and I made my way to the side door of the garage, pushing the sticky door open with my backside. Inside the cool, dark space, I found the metal lid of a Miracle Whip jar, blue with white stars, and dumped my berries into it. I reached for the soft rubber cord of my toy stove. It was teal blue, circa 1960, freshly mined from my great grandparents house. Great grandpa had died doing what he loved: bowling. I remembered him as a softly smiling man with great drooping earlobes. If I squinted, I could remember great grandma Mattie, who had died a few years before. All I could make out was pearl trimmed cat-eye glasses and the blue green paisley of her cotton housedress, and maybe faint laughter. What I knew to be very real was the curiosity of a house they had filled with auction finds and oddities. Their daughter, my Grandma and Grandpa were going to move into the house and modernize it and they said we could take anything we wanted out of it. We filled mom’s blue Chevrolet station wagon to the brim with old school readers, and a pith helmet, cotton tablecloths and McCoy pottery vases and aurora borealis rhinestone jewelry and pink curlers and stacks of fancy and not so fancy dishes and rickety rocking chairs and a toy princess phone and any other oddity that we found poking through rooms we never got to see because they were the mysterious “upstairs” where polite little children never got to see under ordinary circumstances. 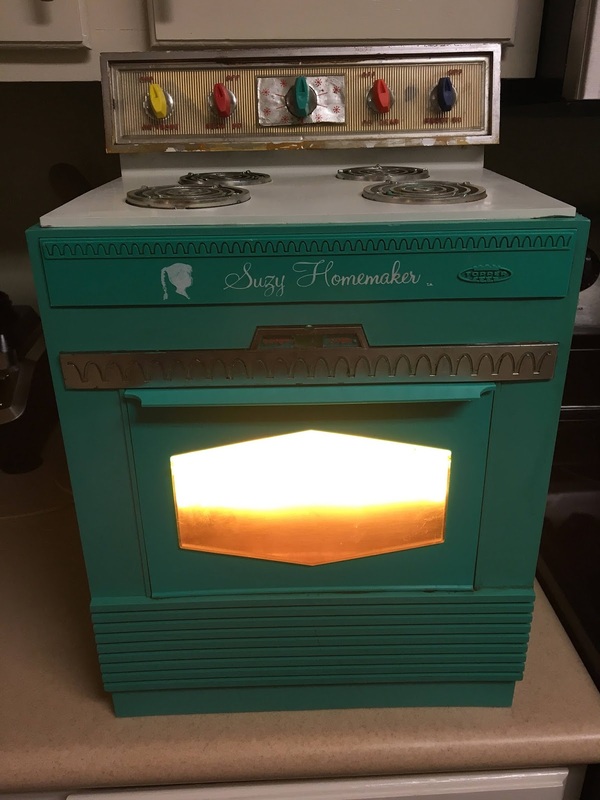 My prize treasure Suzy Homemaker stove had a real electric cord and had a 60-watt light bulb inside that lit up when I plugged the cord into the socket above dad’s workbench. I slipped my pan of berries into the oven and closed the door, my little heart filled with expectation that my berries, stems and all, would come out just like Mom’s jam. I kicked the wet grass clippings off my feet, and felt the itchy half-second when your bare skin seems to absorb the dew and you are suddenly sparkly clean. Just then, my mother softly appeared from behind the interior basement door. “What are you doing?” she wondered aloud, taking in the scene of six year old girl, brown curls teased out of long braided pigtails, bare feet, pajama clad, with light glowing out of a toy stove that never knew a safety standard. “Oh! That won’t work!” the corners of her mouth twisting up and down at the same time, while she unplugged my stove. I couldn’t imagine why my plan wouldn’t work. I had berries and I had a stove. Just like Mom. What other wonders would I need to be all grown up? It seems to me that for every tiny thing in my small world that opened me up to wonder, a place was made for wonder to remain in me. Like the tiny seeds of a strawberry, they grew to make space for the huge wonders of the world.... Niagara Falls, falling in love, the New York City skyline, and my own babies. The last of those four surprises pushes open my door at ungodly early hours of the morning with a clear agenda. She has gray eyes and three freckles on each cheek that appeared over night when I wasn’t looking. She wears a 12 year old shirt, soft and ragged that I prophetically saved from her oldest sister. It reads, “It’s great to be an American girl.” Her miraculously tiny human underwear are miraculously dry through the whole night. And before I can form a clear thought beyond “coffee,” she announces her intention to go right on outside to our own suburban garden. As always, yourcwritinf leaves me completely in awe. 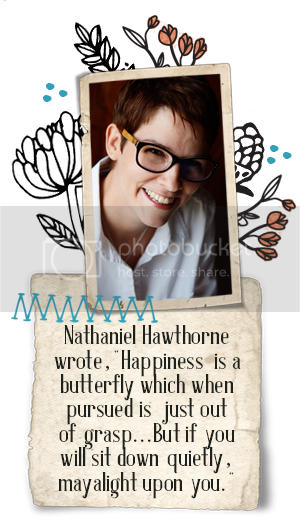 Thank you for sharing the sweetness of your childhood, the beauty of your words, and the brilliance of your mind that can always pull it together in a magical way. Can you tell what I was writing above when the dog started barking to be let out? Stitch Fix #10 - The Stylist Makes a Big Difference!